Anhingas are large water birds common here in Florida. You often see them pose with wings spread as they dry out after a swim. You can read more about them in this article on Wikipedia. For most of the year you might say they’re drab, especially around the head with plain black or brown feathers and eyes. But with springtime love in the air, their appearance changes – especially for males. They develop highlights in the feathers on the back of their heads, a lot of color around their eyes, and look like they wear red contact lenses. This fellow has the full style going. Here’s a close up crop from this photo so you can better see the colors and detail (click for a larger version on Flickr). They’re very handsome and I enjoy photographing them, especially when they’re as patient and tolerant as this one was. I made the photo at Gatorland in Orlando on March 10th during my first visit this year. The breeding season is underway and hundreds of wild birds are participating. It’s a wonderful opportunity to see colors and behaviors of anhinga, egret, herons and other species up close. And Gatorland has an early entry program for photographers so you can photograph in the early morning light while avoiding crowds of tourists later in the day. Go see for yourself! During bird nesting season (February – mid June in Central Florida), Gatorland’s Photographer’s Pass program allows early entry to the park at 7:30 am Thursday – Sunday and lets you stay until dusk on Saturday. It’s great if you want to photograph wild birds in good light outside of normal business hours when there’s not many tourists around. You can find out a lot more detail on their website at this link. This season started last Thursday and I met Tom M., Zvia S., and Lee A. there. It’s early in the year so there’s not too much nesting activity yet, but there’s plenty to photograph. We saw many Great Egrets in breeding colors and plumage, and a few have started building nests. We also saw Anhingas, Cormorants, Black Vultures, and some Snowy Egrets, Wood Storks, and Great Blue Herons. I even sighted a Belted Kingfisher and a Black-crowned Night Heron. The boardwalk along the breeding marsh offers close up looks at wild birds that are used to photographers and cameras. Gatorland is also a great place to practice flight photography. The birds often fly over the boardwalk, many times along the same routes. With a little study, you can anticipate their path and get some good shots. And of course, there are lots of alligators to photograph too. Sunbathing gargantuan gator – I was about 15 feet away with my long lens zoomed out and had to make a 3 frame panorama to fit it all in. We had a great time at Gatorland. If you want to get some really good photos of typical Florida wading birds, this is a wonderful place to do it. You can view many other Gatorland photos in this set on Flickr. Thanks for stopping by and reading my blog. I hope I’ll see you at Gatorland one morning making photos! We’re blessed in Florida with wildlife we can easily photograph. Alligators are common, and many kinds of birds too. But how many photos do you need of a Great Blue Heron, or an Alligator basking in the sun? If you live here for a while you may get jaded with our common animals. So much so that you don’t even bother taking a photo of one when you see it. “Familiarity breeds contempt” and it’s a real risk in photography – one you must not fall into! I have plenty of Anhinga photos but I was still excited to make this recent one. This isn’t close enough for a “record” shot of the bird. The Anhinga’s just one element of the composition. But I like the light, the reflections, and how the bird’s pose echoes the tree’s shape. If I had glanced at this and only seen the bird, I’d have missed the photo-op. To be a better photographer, you have to really observe things you glance at all the time. Watch for good light and backgrounds. Keep an eye out for unusual behavior, poses, or patterns. And of course pay attention to new life birds or rare animals to help keep things interesting. Avoid the familiarity trap. I’ve put a few other examples in this set on Flickr. Keith H. and I took advantage of our annual photo passes and stopped by Gatorland yesterday morning. If you’ve planned to see the wild bird rookery there, don’t wait too long. There’s a lot going on now and it won’t last forever. Cattle Egrets and Cormorants are still incubating eggs and should start hatching soon. Great Egrets, Tri-colored Herons, Anhingas, and Woodstorks have hatched and you can get great photos of parenting activity including feeding, nest maintenance, displays, and flight to / from nests. All of the birds are in peak breeding colors. Gatorland is a great place to practice flight photography. Observe the bird behavior for a while, pick a likely place with a good background (hopefully in the shade) and wait. Opportunities will occur! Most of the Cattle Egrets were back in the bushes, in bad light and obscured by twigs. Be observant and patient you’ll find one out in the open and maybe even in front of a dark background. Anhinga in flight – they’re very different (and attractive) in breeding season. We also saw several other birds types including a Swallow-tailed Kite. If you go during the week, take advantage of the early entry option. We got there at 7:30 and there were only a few other photographers there. As we were leaving about 10:15, there was a huge line waiting to get in. I don’t know about you, but I prefer to photograph in the early morning light and when it’s peaceful. Another reason to visit Gatorland is to see the new Panther Springs exhibit. These animals are very impressive – I didn’t realize how large they are. These two are a brother and sister pair that were raised in captivity and so can’t be released back to the wild. 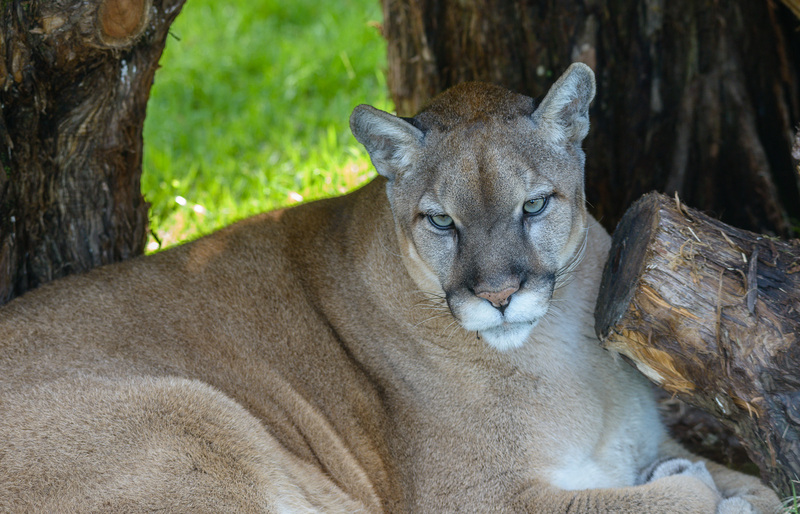 The Florida Panther population is estimated at only 100 – 160 in south-west Florida. Well worth seeing. Our local photography club organized an expedition to Viera Wetlands yesterday. It was one of our larger outings, with 8 people from the group there, including one new member. We arrived just after sunrise and spent a little over 2 hours exploring the main site, and also took a quick tour of the click ponds. Great Blue Heron: These birds aren’t nesting yet, but they do seem to be reserving their spots. Wow – what a day for avian variety and nature lovers! The weather was quite nice too – sunny with temperatures in the 50s. There isn’t much nesting going on yet, but we did see an amazing number of both year-round and winter visitor species. Several of these birds are difficult to spot and / or photograph well and it helps to make multiple circuits of the wetlands. It also really helps to have multiple sets of eyes watching for and pointing out interesting things. About the only thing we struck out on was the River Otters, but we did hear others talking about them – so they were around somewhere. Belted Kingfisher: There were several of these at Viera Wetlands yesterday. They generally stayed out in the middle of the cells and so were hard to photograph. Here’s a list of birds we spotted: American Bittern, Anhinga, Belted Kingfisher, Blue Wing Teal, Coot, Double Crested Cormorant, Glossy Ibis, Great Blue Heron, Great Egret, Green Wing Teal, Little Blue Heron, Little Egret, Hooded Merganser, Common Moorhen, Northern Harrier, Northern Shoveler, Red Shouldered Hawk, Gulls, Snowy Egret, Tricolored Heron, Wilson’s (or Common?) Snipe, White Ibis, Wood Stork, and others that I probably forgot or that we still have to identify. If you haven’t been to Viera Wetlands recently, you really ought to check it out. You can click on these photos to go to Flickr where you can look at larger versions. You can see more of my photos from Viera Wetlands in this set on Flickr. You can also visit our photography club’s group photo pool on Flickr here.